This post marks Part 16 of the 20-part series The Oscar 100. Join me as I reflect on the 100 greatest Oscar-nominated performances and what made them so richly deserving of recognition. Sellers portrays Chance, a simple-minded gardener who for his entire life has resided in the Washington, D.C. home of his employer. He has never left the property, instead spending his days tending to the garden and watching heaps of television. When his benefactor dies, Chance is ordered to move out and, while aimlessly wandering the streets, is struck by the car of elderly business mogul Ben Rand (Melvyn Douglas) and his younger wife Eve (Shirley MacLaine). The Rands, who mistakenly believe his name is Chauncey Gardner, take Chance in and are won over by his refined demeanor and appearance. Ben, an adviser to the President of the United States (Jack Warden), introduces Chance to D.C. society, where he quickly becomes the talk of the town. This performance marked Sellers' second and final Oscar nomination. The release of Hal Ashby's Being There over Christmas 1979, and the across-the-board raves it earned for its leading man, marked something of a comeback for Sellers, who'd spent much of the decade more or less on autopilot. Sure, the Pink Panther sequels made money but the non-Clouseau vehicles more missed than hit. His earlier 1979 release, The Prisoner of Zelda, was an embarrassing failure that in fact earned Sellers some of the worst reviews of his career. Thankfully for Sellers, Burt Lancaster, who Ashby first eyed for the role of Chance, was not interested, nor was Sir Laurence Olivier, who passed on the project to instead take supporting turns in A Little Romance and Dracula. It's hard to fathom either of these gentleman, superb actors as they were, being as pitch-perfect a fit for this charmingly oddball role as Sellers proved. Under the magnificent direction of Ashby, then on the hottest of hot streaks after The Landlord, Harold and Maude, The Last Detail, Shampoo, Bound for Glory and Coming Home (all Oscar-nominated pictures), Sellers has never been in better form. To the surprise of no one, he, the ultimate method actor, disappeared into the role of Chance the moment he stepped foot on set, both in front of and behind the camera. There isn't a single moment in which Sellers doesn't wholeheartedly convince in this most peculiar of roles. If Sellers is perhaps a tad off-putting as Being There first opens, it isn't long before he makes Chance an entirely fascinating and endearing character. He doesn't have much in the way of dialogue - few of his lines run longer than a sentence - yet more than holds his own as Douglas and MacLaine, who do lots of talking and are absolutely fabulous, also triumph in their respective roles. Sellers puts meticulous effort into Chance's every manner and movement. It's a strange and offbeat performance and yet also a gentle and enchanting one. While his life dramatically changes, Chance himself doesn't much evolve throughout Being There, nor does he show a great deal of emotion (sans in his final, devastating scene opposite the dying Ben). Yet, there's undeniable heart and sensitivity in Sellers' portrayal. His scenes opposite MacLaine are often uproariously funny ("I like to watch"), while there's a subtle poignancy to his moments with Douglas (who deservedly won the Best Supporting Actor prize). Despite the film's critical and commercial success and Sellers' more than three decades in show business, he was an underdog on Oscar night, albeit almost surely the runner-up. Hoffman, as expected, triumphed for the Best Picture-winning Kramer vs. Kramer. Sellers didn't even bother to attend the ceremony, nor did Pacino or Scheider. Sellers would make one final, decidedly inferior film, The Fiendish Plot of Dr. Fu Manchu, before his death at age 54 in the summer of 1980. No one may remember that last picture but we'll surely never forget his sublime penultimate performance in Being There. Welles portrays Charles Foster Kane, the legendary, elusive newspaper tycoon who on his deathbed utters one final word - "Rosebud." Reporter Jerry Thompson (William Alland) is tasked with discovering the meaning behind the mysterious term and, through interviews with Kane's friends and associates, uncovers the man's awe-inspiring rise from obscurity to sky-high fame and subsequent decline into isolated oblivion. This performance marked one of three 1941 Oscar nominations for Welles, who also earned a Best Director nomination and the win in Best Original Screenplay. Citizen Kane is hardly a film starved of acclaim. It is, after all, perhaps more than any other motion picture in the history of cinema, the film most most consistently found atop lists of the all-time greatest movies, among them the American Film Institute's ranking in 1998 and subsequent update in 2007. 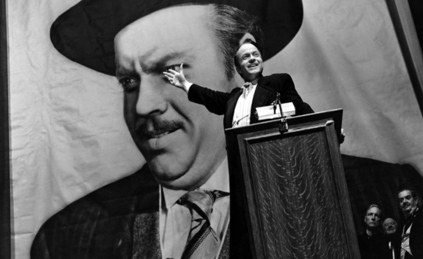 With that said, if anything is perhaps underrated about Citizen Kane, it is Welles' performance in the titular role. In reading essays on and reviews of his picture, you're liable to find heaps more focus on his direction and screenwriting than Welles' acting, which I would argue is a tad unfair. Yes, Welles' contributions on the page and behind the camera are undeniable but his is also is a complex, convincing, all-around magnificent performance that is tough to imagine another actor pulling off. Perplexing as it is to fathom today, Citizen Kane, while an instant smash among critics, was not a commercial success upon its theatrical release in 1941. Many theatres feared being the victims of a libel lawsuit by William Randolph Hearst, the inspiration for the picture who was hellbent on suppressing its release, and thus refused to show the film. The film earned modest receipts in major cities but was a complete non-starter in more rural areas and ended up losing money overall. This underwhelming reception extended to the Oscars, where Welles' film was nominated for nine prizes, including Best Picture. Critics, head over heels for the picture, forecasted a grand evening for Citizen Kane and expected the film to prevail in most categories, including Picture and Best Director. Instead, the film found itself mostly steamrolled by John Ford's fine, if inferior How Green Was My Valley. Ultimately, Citizen Kane would land only one prize on the big night, for the Welles-Herman J. Mankiewicz screenplay, which did not face How Green Was My Valley in its category. In Best Actor, Welles lost, as expected, to Sergeant York's Cooper. What's particularly remarkable about Welles' performance is the stunning transportation of Kane through the decades. He instills effervescent vitality into Kane as a twentysomething, at last securing control over his trust fund and determined to leave a mark on yellow journalism. As Kane rises to power by hiring only the best journalists and manipulating public opinion, Welles is the most euphoric of sights - which only makes Kane's downfall to come all the more affecting. As the film proceeds through the years, Kane looks and sounds more worn down and exasperated. His first marriage disintegrates as he becomes romantically involved with wannabe-songstress Susan - an affair which ultimately ends his political career ambitions. Perhaps the most heartbreaking part of Citizen Kane is his yearning to be closer to young son Charles Foster Kane, III, which becomes exceedingly difficult as the world around him disintegrates. His son, no doubt, recalls to Kane a simpler, more fulfilling time, which remains on Kane's mind all the way through to his death. In the picture's final chapter, Welles is stunningly convincing portraying Kane in his old age. Disillusioned by the world outside his imposing, isolated estate, Kane is at this point an unhappy and unpleasant old man, driven to a violent breakdown following the desertion of his second wife. While Welles is a desolate and even frightening sight in these scenes, the final shot of "Rosebud" brings the proceedings full circle and delivers the ultimate gut punch - while it may not grace the screen, don't be surprised if Kane's extraordinary life suddenly flashes before your eyes. Citizen Kane is a miracle of a motion picture, somehow Welles' directorial debut, and essential to its success is the towering performance of its leading man. Clift portrays Ralph 'Steve' Stevenson, a World War II-era American soldier who befriends Karel (Ivan Jandl), a young Czech boy and concentration camp survivor. Steve takes Karel in, teaches him English and even considers bringing him back to the United States but the boy is determined to find his mother Hannah (Jarmila Novotná), who became separated from him at Auschwitz. All the while, Hannah has been looking for Karel, a search made exceedingly difficult by the boundless number of refugee children in the region. This performance marked Clift's first Oscar nomination. By age 25, Clift had appeared in a dozen Broadway productions and worked alongside the legendary likes of Tallulah Bankhead, Fredric March and Dame May Whitty. While established on the New York stage, he was a nobody when he made the move to Hollywood...not that this lack of name recognition would last terribly long. His first film role was a significant one, opposite John Wayne in Red River, but that picture wouldn't hit theatres until late summer of 1948. Instead, moviegoers would first be introduced to this stunning young actor that spring, in Fred Zinnemann's The Search. The Search, one of the first motion pictures to address the Holocaust, made Clift an overnight sensation, the great new male star of the silver screen. Not until Marlon Brando in The Men and especially A Streetcar Named Desire a few years later would the industry behold such an awe-inspiring (and strikingly naturalistic) introduction. As Steve, the compassionate American G.I., the unknown Clift was so seamlessly convincing, Zinnemann found himself approached by critics and audiences alike, impressed the director would hire a real soldier without acting experience for the role. Of course, in reality, moviegoers were not only unfamiliar with this dashing leading man but also relatively unacquainted with such an unaffected, lived-in style of performing. Many future actors, among them Clint Eastwood, would later cite Clift in The Search as a performance that left a significant influence on them. Never has Clift been as irresistibly affable as he is in The Search, devoid of the character flaws so many of his later roles would be consumed with - not that Clift has ever proven truly unlikable in anything either, given his intense charisma comes through in even the shadiest of characters. His rapport with Jandl (who is terrific and would win a specific juvenile Oscar for his turn) is affecting in a very subdued way, never succumbing to mawkishness or ringing the least bit false. Clift's best and most heartbreaking scene in the picture comes when Steve, having searched for Karel all night and with reason to believe Hannah was executed, tells the boy his mother has died. The actor, having quarreled with screenwriters Richard Schweizer and David Wechsler throughout the production, convinced Zinnemann to eliminate their ham-handed dialogue and keep this conversation at a sensitive and genuine level. The way Steve gently replies, "no, dear," when Karel asks if his mom will ever come back, is absolutely gut-wrenching. Despite the actor's reservations with the film's screenplay, Clift would rightfully go on to label The Search as one of his finest's screen turns. The picture itself may not be the masterpiece that say, A Place in the Sun or Judgement at Nuremberg are in their respective filmmakers' libraries, but it's nonetheless a must-see, both for Jandl and to behold the breathtaking wonder that is Clift. Hepburn portrays Jane Hudson, a lonesome Ohio secretary who has all but resigned herself to spending the rest of her life in solitude. She has saved enough money for her dream vacation - a picturesque summer trip to Venice. There, she at last meets the man of her dreams, the dashing and refined antique store owner Renato de Rossi (Rossano Brazzi). Jane falls head over heels but is soon tested by the revelation that her new beau is leading a double life. This performance marked Hepburn's sixth Oscar nomination. Before David Lean's sublime Summertime, there was its inspiration, The Time of the Cuckoo, a play written by the great Arthur Laurents for the inimitable Shirley Booth. Booth would win the Tony Award for her performance but, despite scoring the Best Actress Oscar in 1952 for Come Back, Little Sheba, was not viewed by Hollywood as the ideal leading lady to bring the piece to the big screen. After an arduous pre-production in which the likes of directors Daniel Mann and Roberto Rossellini and stars Olivia de Havilland and Ingrid Bergman were loosely attached at various points, it would ultimately be Lean and Hepburn headlining the picture. And thank heavens for that as, for my money at least, neither Lean nor Hepburn ever before or after shined as luminously as they did on this slice of cinematic heaven. Summertime is a legit miracle of movie magic, the finest actress to ever grace the screen and one of the all-time great filmmakers working in pitch-perfect harmony. This may not be the most extravagant of Hepburn performances and no, it didn't win her the Oscar (Magnani was way out front, though Hayward had a passionate base of support too and was starting to look overdue), but that doesn't mean it's not her best. The great Kate can be deliciously daunting when she pleases but she's really at her most enchanting when exuding a palpable sense of vulnerability, which is most certainly the case in Summertime. 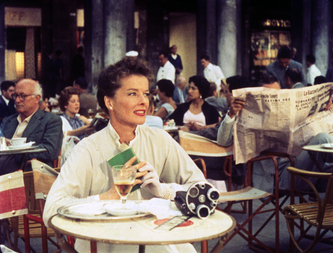 Hepburn would portray the occasional spinster but never a figure as timorous as Jane Hudson. To the public, Jane seeks to establish herself a proudly independent woman, perfectly content with wandering the world alone. There is scant doubt to us, however, of the loneliness consuming Jane inside. We feel her sadness and we also feel just as swept off our feet when she draws the attention of the handsome Renato. Not to knock Brazzi, who certainly has an appealing screen presence, but what's particularly special about Summertime and so unlike most other Hepburn pictures is the proceedings completely belong to her, front and center. If there was ever something of a one-woman Hepburn show, this is it, and she's absolutely mesmerizing from start to finish. Also, somehow, she's never upstaged by the sumptuous beauty of Venice around her. Refreshingly, Summertime avoids a saccharine ending and instead ends on a note that more recalls the bittersweet conclusion of Lean's other masterpiece, Brief Encounter. When Jane arrived in Venice, desperate for emotional fulfillment, she presumed such heartache could be washed away by a male companion. Ultimately, she Jane discovers she isn't an insufficient woman without a man by her side - she has proven herself more than capable of charming and pleasing a man but hardly needs one guy for the long term. She is perfectly, genuinely content with leaving Venice alone. Toward the end of his life, Lean repeatedly cited Summertime as the picture he was most proud of. Hepburn seemed less inclined, instead always reflecting on how she performed her own stunt in the scene in which Jane falls into a canal - and how that day of filming, jumping into water full of disinfectant, resulted in her having eye issues that beset Hepburn for the rest of her life. I'd like to think, however, Hepburn revisited the picture at some point. I hope she saw what I see - the most splendid actress in all of film history, shimmering in the finest and certainly most underrated role of her career. Forster portrays Max Cherry, a forlorn bail bondsman, all but sleepwalking through life until the entrance of the beguiling flight attendant Jackie Brown (Pam Grier). Jackie, caught smuggling money from Mexico into Los Angeles for the hotheaded arms dealer Ordell Robbie (Samuel L. Jackson), is picked up from jail by Max, who instantly falls in love with her. Max isn't the least bit hesitant to get caught up in Jackie's games, as she plots to double-cross both Ordell and the law enforcement agents (Michael Keaton and Michael Bowen) who want to use Jackie to bring Ordell down. This performance marked Forster's first (and to date, only) Oscar nomination. By the mid-1990s, Forster's career was all but on life support. All too briefly on the A-list in the late 1960s with acclaimed turns in the likes of Reflections in a Golden Eye and Medium Cool, Forster struggled in the coming years to land projects worthy of his talents, instead slumming in B-movie fare like The Black Hole, Alligator and The Delta Force and eventually relegated to nothing but direct-to-video offerings, which generally found the actor in a mere cameo role. Enter Quentin Tarantino, suddenly the hottest of filmmakers after the smashing success of Pulp Fiction, and Forster's career woes were about to change. The two had actually crossed paths earlier, with Forster auditioning for the part of Joe Cabot in Tarantino's Reservoir Dogs. The director ultimately cast silver screen legend Lawrence Tierney but Tarantino, who worshiped Forster's turn in Medium Cool, was not about to forever forget the floundering actor. Tarantino, after Pulp Fiction working on a film adaptation of Elmore Leonard's Rum Punch, bumped into Forster at a Los Angeles coffee shop. At this point, the actor was without an agent and taking any role he could possibly get, the latest being a small part in the direct-to-video slasher flick Uncle Sam. So, when Tarantino floated to Forster the key role of Max Cherry in the adaptation, it was like a gift sent down from the heavens. Not only did Forster get his comeback and Oscar nomination, he also managed to turn in the greatest performance to grace a Tarantino picture (well, tied with co-star Grier, who inexplicably found herself snubbed in Best Actress after a healthy precursors run) and also one of the finest turns ever up in Best Supporting Actor. Forster's turns in Reflections in a Golden Eye and Medium Cool are fantastic but not quite indicative of his sky-high strengths as an actor displayed in Jackie Brown. His portrayal of Max Cherry might just be the least showy performance to grace the Oscar 100, so, no doubt, some will greet his inclusion with a scratch of the head. With that said, I happen to see Forster in Jackie Brown as one of the most quietly soulful and beautiful performances of the past half-century of cinema. When Max first enters Jackie Brown, approached by the overbearing, fast-talking Ordell, he may be the consummate professional but there's scant doubt about his loneliness and the restlessness he feels toward the job he's spent decades doing. The moment he encounters Jackie, however, as she exits jail and Bloodstone's heavenly "Natural High" fills the air, Max looks not only immediately, head over heels in love with her but suddenly instilled with a far greater purpose than the usual routine. Max may keep his affections to himself but the chemistry between Forster and Grier couldn't be more enchanting as both actors sink their teeth into the most sparkling dialogue Tarantino has ever written. Forster has a giddy blast as Max partakes in Jackie's convoluted game of survival but by the two-hour mark, a feeling of melancholy sets in - the Max and Jackie union will inevitably come to an end, and it does, as Forster and Grier share one of the most bittersweet scenes ever captured on film. At last, Max and Jackie reveal their feelings for each other and share the most tender and genuine of kisses. The phone in Max's office rings as Jackie hits the road and says her final goodbye. Max, distraught and suddenly questioning his decision to stay behind and not join his soulmate, ends the phone call and heads to his office to be alone. He's the most sorrowful of sights. Much as I worship this performance, Forster's award was really the nomination itself, with critics' favorite and Golden Globe winner Reynolds in a dead heat with SAG Award winner Williams. Forster may not have prevailed but Jackie Brown still rescued his career and he's gone on to emerge a reliable character actor on both the big and small screens. He even has a possible Oscar bid this year, opposite Hilary Swank and Blythe Danner in the drama What They Had. 26. Richard Burton, Who's Afraid of Virginia Woolf? 27. Elizabeth Taylor, Who's Afraid of Virginia Woolf? Next week - as the Oscar 100 winds down to its bittersweet end, I've got the final Woody Allen-directed performance to grace this list; the youngest Oscar 100 inductee; two sublime Best Actress winners; and a leading lady who lost but surely would've won in nearly any other year.